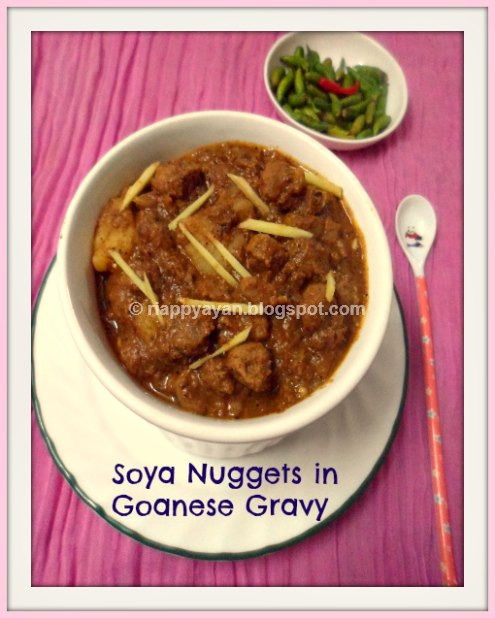 I am always in hunt for something different recipe for Soya chunks or Nuggets, which is not so loved by anyone in my family, especially my daughter. I found this recipe on Nutrela's Fb page where they shared the recipe and I immediately saved the recipe and tried within few days. 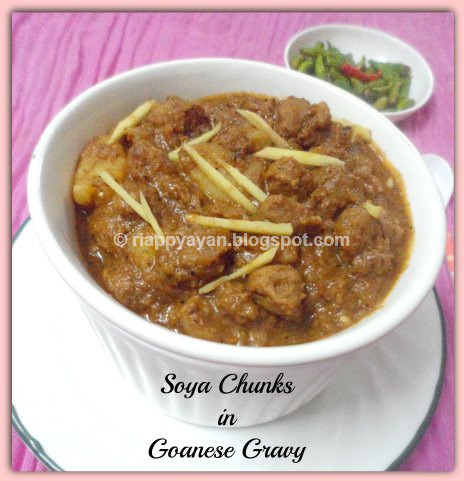 This is soya chunks cooked in a Goanese Curry recipe. I already tried this curry version with chicken, but not with soya chunks. It tasted really delicious and the best part is my daughter polished it off who just hate to east soya chunks, gave a thumbs up and asked me o make this again. For me, it's a keeper recipe. Give it a try, folks!!!!!!!!!!! Poppy seed : 1 tsp. Coriander seeds : 1 tsp. Boil the soya chunks in a bowl of water for 4-5 minutes, drain and squeeze as much water as possible and keep aside for later use. Heat 1 tsp.oil in a pan, add dry red chilli, black peppercorns, cinnamon stick, poppy seed, coconut and coriander seeds. Roast on a medium flame till aroma releases and keep aside. Pierce the onion with a fork and roast it in open fire till black, remove the outer skin when cool and keep aside. Boil the tomatoes in a bowl of water, boil and when they are pulpy, remove, cool and make a smooth puree. In a blender, add roasted onions, garlic, roasted spices and with a little water, make a fine paste. heat rest of the oil in a pan, add the masala paste, tomato puree, salt and sugar. Mix well and add soya chunks and green peas in there. Cook for 4-5 minutes in medium flame with lid closed. Check the consistency you desire for gravy. Remove from heat. Serve garnishing with fresh coriander leaves.